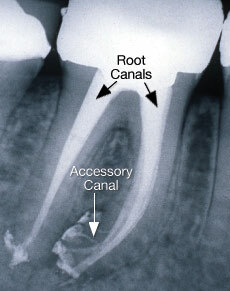 Accessory canals often cause complications during root canal treatment. Advances in technology like microscopes and filling techniques are successfully used to treat these complications. I had a root canal treatment a while ago. The tooth recently started to hurt and was retreated. The endodontist said there were accessory canals causing the problem. Could you explain? With proper care, most teeth that have had a root canal can last as long as other natural teeth. In some cases, however, a tooth that has received endodontic treatment may not heal properly. Occasionally, the tooth becomes painful or diseased months or even years after successful treatment. This can happen with any dental or medical treatment and a recent Dear Doctor magazine article on root canal retreatment listed possible reasons a root canal may not heal. One is the complicated shape and form of root canals, which may be undetected in the first procedure. Narrow or curved root canals that sometimes pose complications during the initial procedure. The placement of the crown or other restoration was delayed following the treatment, resulting in bacterial re-infection of the root canals. An inadequate seal of a restoration (filling) allowed bacterial recontamination of the inside of the tooth. Accessory or lateral canals are part of a complicated root canal anatomy that may have been undetected in the first procedure. Root canals, which house the contents of the pulp of a tooth (blood vessels, nerves and connective tissues), can be quite elaborate. Like the root system of a tree or plant, the root canal system of a tooth may have tiny branches coming off the main canals. These accessory canals are usually located in areas where the roots of multi-rooted teeth join, or around the last third of the root, but can also be found anywhere along the length of a main root canal. An x-ray showing multiple accessory canals successfully treated. Accessory canals can sometimes be quite difficult to detect, clean and fill. If tissue is trapped inside one of them, it can become infected and die. If accessory canals open into the periodontal membrane (the attachment mechanism between the tooth and bone) they can give rise to periodontal (gum) problems in addition to endodontic (root canal) problems. If your tooth has failed to heal or has developed new problems, you do have a second chance. Another endodontic procedure may be able to save your tooth. This is called retreatment. While challenging, accessory canals can be successfully treated to save an affected tooth. This often requires the skills of an endodontist, a specialist in the diagnosis and treatment of root canal disorders, who will use advanced technologies such as microscopes and specialized filling techniques to treat these minute canals. What follows are illustrations of successfully located and treated accessory canals. There is a certain kind of beauty to their intricate patterns. We fully appreciate that beauty may be in the eye of the beholder, but this is one more area where art and science overlap in nature's intricacy. We hope this brief explanation helps. Photo Credits: © Dear Doctor, Inc. Used with permission.